In the field of speech-langauge pathology we often read that our role in literacy intervention lies within pre-literacy skills called, phonological awareness skills. This information comes to our field from educational research that holds phonology, specifically, phonics, as primary in reading and spelling instruction. As an SLP I was very interested in literacy when it entered our scope of practice and this is where I started. I analyzed the phonological awareness skills, put them into a hierarchy and presented them to my students I taught in higher education. Looking back, I now realize that was not the best use of my time or theirs. Some of the skills in this category are important but not in the way we targeted them. The first of these skills is phoneme manipulation. Phoneme manipulation involves asking the student to produce words and then alter their pronunciation by adding, deleting, or substituting a different phoneme. Sometimes these new pronunciations represent a word and sometimes they don't. Nonsense words have become a primary tool used to assess literacy skills. While these phoneme manipulation tasks reveal a strength in phonological processing, they are not required to learn to read and spell. While some students with who struggle learning to read and spell in school will find these tasks difficult or impossible, others with dyslexia will find them no problem at all. Dyslexia is not all about phonology, it is about understanding how written words work. These skills do require a certain mental flexibility with phonology, however, these skills are not necessary to learn to read and spell. Those who don’t learn to read and spell in school typically have difficulty memorizing information via drill or repeated exposure. They must be taught directly with meaning to anchor their understanding. Pronounce room then pronounce it after adding a <b> in the beginning. It is of utmost importance that literacy instruction include the teaching of accurate linguistic terminology to allow the discussion of written language. Knowledge of single graphemes, digraphs, and trigraphs as well as morphemes, the units they spell, allow an understanding of the English writing system. The terms allow students to have access to understanding reading and spelling. Nonsense word focus in on a student's ability to 'sound out' strings of letters. There are no graphemes present nor are their phonemes. Those elements only exist in real words. 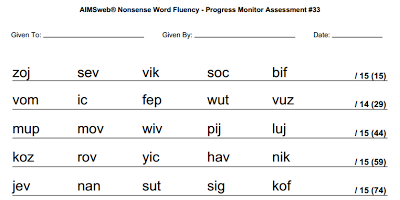 The assessment protocols that use nonsense words include acceptable pronunciations for the nonsense words (sometimes there is more than one possibility). Looking at reading in terms of using this skill as primary neglects the essential knowledge of the role graphemes play in building words and how they represent phonology. More importantly, they neglect meaning, the entire reason for a words existence. Nonsense words need to be replaced with real words in literacy assessments so true linguistic knowledge can be assessed formally. Using real words allows the assessment and teaching of the units that build words. It allows us to notice their structure. Consider the word <cathedral> The point I am going to make is that when you only look at the surface, you can misidentify graphemes. Remember, graphemes can't cross morpheme boundaries. To analyse <cathedral> we build a word sum. Thus, a ‘cathedral’ is a place where you sit down and pray. Because graphemes cannot cross morpheme boundaries the <t> and the <h> in this word each represent their own phoneme. They do not make up the <th> digraph. The Greeks and Latins pronounced the word accordingly. In Modern Day English the word began to be pronounced as if the <t> and the <h> did indeed form a <th> digraph due to a misunderstanding and has ever sense. To look even more closely at the pronunciation of the word we look to it’s phonology. The stressed syllable holds the pure vowel, the rest are reduced to schwa. In this word <e> represents /i/ while the <a> in both syllables represents schwa. An example of why we cannot ‘sound out’ words to determine their spelling or identity. Next, we will look at rhyming as a skill. Rhyming is a metalinguistic skill that requires more advanced knowledge of how phonology works. While it may be a useful skill when writing and understanding poetry, it is not necessarily a ‘pre-literacy’ skill. The ability to identify words that rhyme or produce words that rhyme is not as important as noticing similarities and differences in rhyming words when they are presented. Students who have difficulty with rhyming can still learn to read and spell. It really isn't logical to include rhyming in the beginning of language intervention unless you are using it to teach stress. The way we pronounce English is based on stress. English is a stress timed morphonemic language. Consider the following quote from Shakespeare. So soon to bid good morrow to thy bed." It does make sense to look at two words that rhyme to notice the phonology of rhyming words and see that that various digraphs and single graphemes can represent the same phoneme. Here, we see /head/ and /bed/ rhyme although they include different graphemes for the phoneme /e/. We can notice that digraphs can represent the same phoneme as a single grapheme. After that it would make further sense to look to etymonline.com to see if there is a historical reason for the grapheme choice in a word or if it is used to differentiate it from a homophone. When we teach using rhyming words in this way, we are not teaching 'awareness' we are teaching phonological knowledge. In the case of <bed> if English had used <ea> to represent /e/, the word would have been confused with <bead>, the decorative piece found in jewelry. Fortunately this was not likely considered as the origins of the word explain the choice of grapheme. It from Old English <bedd>. Next, we come to blending. This is a fabricated term that does not relate to how we learn to read or spell. Looking at blending as the first step to reading is stopping at the surface. Teaching this skill enforces the understanding that we ‘sound words out’. The problem with this are the plethora of words that we indeed cannot ‘sound out’. Thinking this way teaches that there are some words that set out to deceive or trick us. Following this thinking, we see our only alternative as memorizing these words through drill and rote practice. Well, we all know that students with dyslexia and other language learning disabilities do not memorize information well. Thus the large number of students of are not learning to read and/or spell. When it comes to this skill, there is no application that makes linguistic sense. Finally, we have segmenting. In education, segmenting can refer to beaking a word down into it’s individual phonemes (phoneme segmentation) or breaking a word up into syllables (syllable segmentation). Phoneme segmentation the way it is typically done is not beneficial in learning to read and/or spell. We do not read one phoneme at a time nor do we spell one phoneme at a time. Phonemes are what we produce when we speak. We read morphemes that are built from graphemes. We spell morphemes using graphemes. When studying words using structured word inquiry we look at the phonology of a word after we already understand and have analyzed a word in terms of structure and history. To go word by word trying to isolate phonemes is a rote task. it is drill and is devoid of meaning. For students with poor working memory and/or poor phonological memory, it is a futile effort. Syllable segmentation, however does have usefulness. This skill refers to clapping or tapping a word out in syllables. This is actually a useful and necessary skill for teaching the phonological knowledge of stress. We need to be able to identify the syllables in a word to determine primary and sometimes secondary stress. This is important to phonology in that the stressed syllable holds a pure vowel in a word while the unstressed syllables hold a reduced vowel, the schwa. Look back to our study of <cathedral> for an illustration of this point. Schwa is the most prevalent vowel in English and is further evidence of why words cannot be sounded out. Seeing students trying to guess at what vowel a schwa is representing hurts my heart. It's totally guesswork. Just try sounding out <banana> as if you didn’t know the word or it’s meaning. Why should we do this to our children or students? Knowledge of stress and the schwa is essential to literacy instruction and to learning. Linguist-educator exchange offers a valuable class on stress and the schwa if you are so inclined. Oh if I could only go back and reteach all of my students I dolled out false information to when they were seniors in college. It’s painful to ponder. Some of that pain is relieved when I blog about the truth about language, hopefully it reaches some of them.